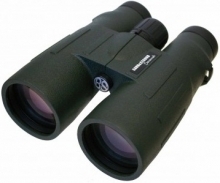 Barr and Stroud Savannah 8x56 WP Roof Prism Binoculars: Barr and Stroud Savannah 8x56 WP Roof Prism Binoculars is ideal for bird watching, sports, travelling, nature observing and many other outdoor activities. It had a BAK4 roof prism with phase corrected to enhance contrast and correct chromatic aberration. The fully multi-coated optics with anti-glare properties improves light intensity and clear true colour view even in low light condition. With its 8x magnification, it allows observer to watch an object very closely and clearly. The long 23mm eye relief design offered viewer to see entire 107m field of view clearly and effortlessly.